CARANTEE Bluetooth 5.0 Transmitter/Receiver --- Match Your Smart Life! CARANTEE Wireless 3.5mm Aduio Adapter has a mini and protable body which is designed to convenient your life.It can be easily and quickly connected with your bluetooth devices within 33 feet.CARANTEE will free you from the mess and simplify. 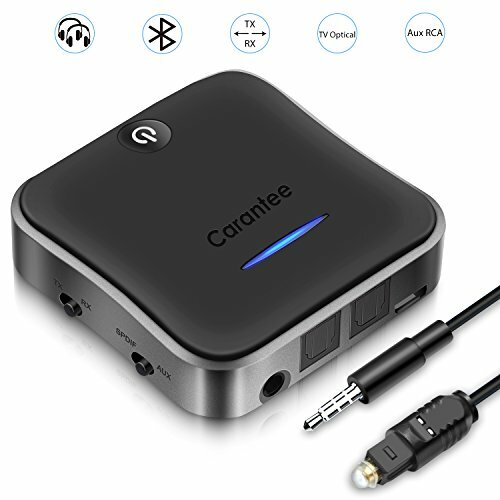 1.Connect the device to your non Bluetooth headphone/home speakers or car stereo system with 3.5mm audio cable. 2.Pair the receiver to your smart device. 3.Now you can enjoy your music through your headphone, speakers,home stereo system/car stereo system, or answer hands free calls. 1.Pair the device to your Bluetooth headphones or Bluetooth Speakers. 2.Plug it in your non-Bluetooth media devices (such as MP3,CD/DVD player,TVs,etc.) via 3.5mm audio cable or RCA cable. 3.Now you can enjoy your music via Bluetooth speakers/Bluetooth headsets from your non-Bluetooth media device! Automatic shutdown function:the device in the absence of the connection state,after 10 minutes,it will automatically go into power-saving sleep mode,the light will turn off. LED Status: red light when charging,fully charged,the red light goes out. Compatibility: compatible with phones and PAD of Android/IOS system,and all the bluetooth audio devices. 【apt-X 0 LATENCY】CARANTEE wireless bluetooth audio adapter adopts high-end Bluetooth 5.0 chip and exclusive CSR8675 solution, no like other Bluetooth 4.2 and low-end CSR. Transmission efficiency is 2 times higher than Bluetooth 4.2 and faster pairing. We promise without any noticeable audio delay when watching match & movies, give you a richer and deeper sound experience. 【TRANSIMITTER RECEIVER 2 IN 1】Receiver mode: Turn the traditional TV car or home stereo, speaker into Bluetooth-enabled ones. Pair by Bluetooth-enabled audio sources such as smartphone, tablet to enjoy music wirelessly. Transmitter mode:Connect the audio devices(such as MP4, TV and PC, etc. )via the 3.5mm audio cable or RCA. Bluetooth transmitter function wirelessly streams audio to Bluetooth speakers. NOTE: The adapter needs to be set in the transmit mode. 【ULTRA PURE SOUND】Bulit-in enhanced signal transmission circuit and super transmission speed bluetooth 5.0, connectedfaster, farther and more stable. Built-in AEC echo can cellation and ANC noise cancellation circuit, sound more pure, provide CD-like high sound quality enjoyment. 【SUPER DUAL STREAM】CARANTEE Bluetooth V5.0 transmitter can be paired with two Bluetooth receivers simultaneously, and with the latest ANC noise reduction and echo cancellation technology, we promise you to enjoy movie time with your lover and without disturbing children's sweet dream. 【ALWAYS ON】CARANTEE Bluetooth 5.0 2 in 1 Adapter continuously streams even while charging. Built-in 600MAH lithium polymer battery for up to >20 hours use, 3 hours to fully charge, we promise you to enjoy your favorite wireless content all the time. Certainly, we also offer 18-MONTH CARANTEE warranty & 30-DAY money back guarantee. If you have any questions about this product by CARANTEE, contact us by completing and submitting the form below. If you are looking for a specif part number, please include it with your message.